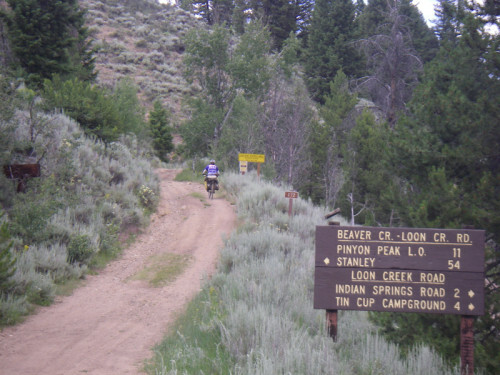 Several years ago we did a bike tour in Idaho that was focused on gravel roads and hot springs; two great bike touring elements that exist in plenty in that fine state. Since then we have been looking at other Idaho options, and since mid-July is almost as hot in Idaho as it is in Utah the hot springs part didn’t have as much appeal as it did for our previous October trip we left out available hot springs as a priority. 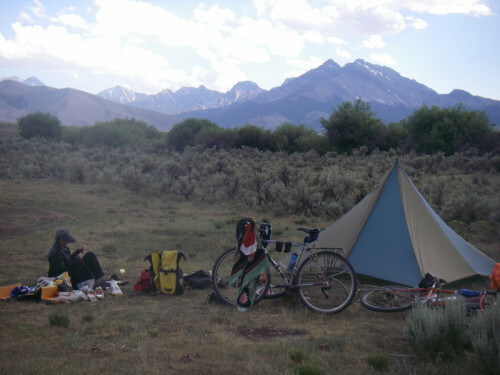 Because Idaho offers more amazing backcountry bike touring than anywhere we knew we could figure out a killer route without too much effort. Sun Valley always seems to be a great starting point; it’s the closest “nice” Idaho to Salt Lake and you can go north, east, and west from there into great terrain. We hadn’t done much out to the east, so that’s the direction we decided to go first. The first few miles leaving Ketchum didn’t feel very adventurous as we wheeled along the Trail Creek bike path with the many Sun Valley vacationers on cruisers, BMX bikes, scooters, and strollers, but soon enough the bike path ends then the pavement ends and we started churning up towards Trail Creek Pass (that goes over the northern end of the Pioneer Mountains). Trail Creek is a pretty mellow pass to cross – at least, with fresh legs – and is followed by a long descent towards the Lost River valley. 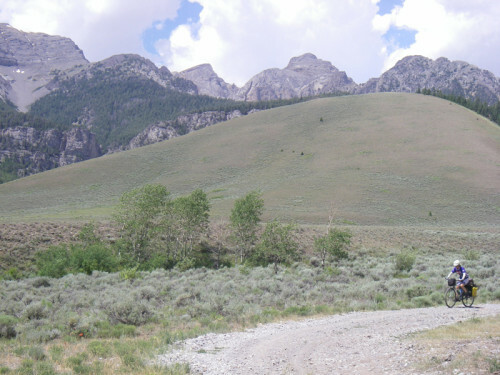 However, about halfway down to the main valley we veered south into the Copper Basin, which is a remote area on the backside of the dramatic Pioneer range that is made up of craggy 12,000 foot peaks. 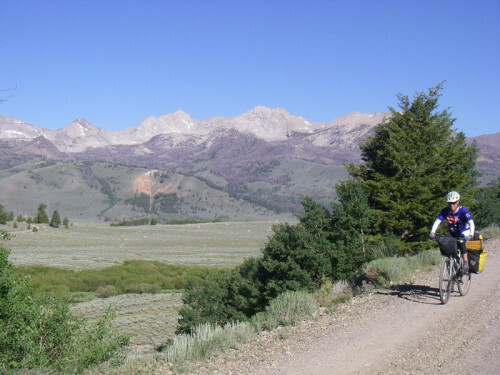 The Copper Basin road is a 20 mile loop that goes into a kind of nook in the mountains, and proved to be a worthy side mission on roly, deserted roads to gape up into the Pioneers and camp alongside mountain streams. Ashley Patterson gets up close and personal with the Pioneers. An easy day of riding brought us into the Lost River valley, which has highway 93 running through it from the east Idaho desert up to and along the Salmon via Mackay. Mackay is a bit more classic Idaho town than the surreal Sun Valley; a fairly hardscrabble little place that could be an outdoor mecca due to its close proximity to plenty of mountains – including Mt Borah, the highest peak in the state – and the Lost is one of the premier trout streams in a state that knows its good trout streams. But without “cute” it will probably always remain a bit gritty, as it probably should be; there can’t be Sun Valleys everywhere. But soon enough we hit Highway 93 that runs along the Salmon river to the town of Salmon, in the process getting caught out in a shelter-less area by a decent thunderstorm complete with helmet-vent-intruding hail just before we hit town. Twenty more miles and we were able to leave the highway and ride along the lonely road that goes down the river towards the Middle Fork Salmon river take out and the main Salmon put in, so the only vehicles going by were the occasional river trippers. Our destination was the Panther Creek road, which not surprisingly runs along Panther Creek, which parallels its much-larger sister to the west, the Middle Fork. Like the MFS, Panther bisects a one of those really big swaths of green you see on Idaho maps, and is a critical conduit for backcountry travelers in those parts because it goes over 65 miles through that particular green swath back to Highway 93. Amazingly, it’s a 45-mile climb to the pass! It only climbs 4500’ in those 45 miles, so it’s not consistently steep, but it’s a long grind nonetheless with not much of anything/anybody out there. 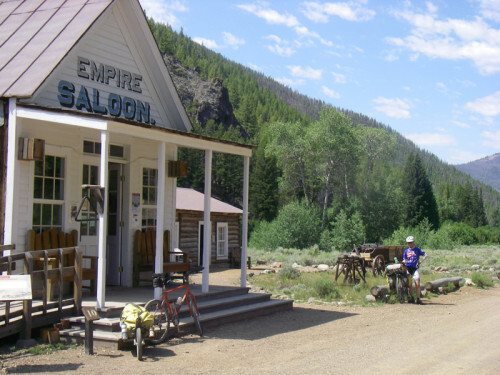 From Challis – which is another town not far from “cute” Ketchum and Stanley yet culturally in another galaxy – we caught another key conduit: the “Custer Parkway” that goes from Challis to the old mining boom town of Custer. I’m not sure how they came to apply the term “parkway” to a one lane gravel road that not only had some brutally steep sections up to an 8800′ summit, but was also completely washed out in places, but it was fine riding (and it was built in less than a year in 1879!). On top of the first super mean climb under a blistering sun the only car we’d seen – an ancient, beat to crap Ford Tempo with unrecognizeable license plates came wheezing up past us, sighed to a stop, and out hopped….what I can only describe as “hippies”. I’ve been to Dead shows and know and have been part of the crowd, but even so these folks were impressive in their hippiness: reams of hair, gallons of patchouli oil, everyone tie died head to toe; the works. And there seemed to be something like 7 of them in this car that “was gettin’ a little hot; it doesn’t really like hot climbs like this” along with a ton of stuff as well as a huge fluffy dog! “We are looking for this place that has a bunch of opals; have you seen any? !” Huh? Opals? Of course that’s what you’re looking for! But no, sorry, haven’t seen any, but I can’t see much through my sweat-stung eyes. So we weren’t much help on the opal front, but despite this they reached into the depths of the Tiempo and pulled out an ice cold Henry Weinhard’s root beer and offered it up, which was much appreciated. Thanks much, and good luck opal hunting! The town of Custer is about 10 miles up the Yankee Fork river, which in turn is about 20 miles from Stanley. It was a former gold rush boom town in the 1870’s and is now a tourist destination and gives a pretty good glimpse into life back then. Not far away is an amazing dredging machines that was actually a converted steamship that they somehow carted into the wilds of Idaho to churn up miles of a river bed. Sort of an environmental nightmare, of course, but they didn’t think much of that then, and there’s still a big working mine above town that not only is literally tearing down the mountains but is also likely using cyanide to leach out the gold, which makes the dredging seem not so bad. In any case, Custer is a worthy stop, especially for families with kids who might be interested in old west history. The hamlet of Loon Creek was up and over another big pass and deep in the Frank Church wilderness; in fact, the road that we were on is bordered for something like 70 miles by wilderness on both sides, so the road and the village was basically a grandfathered-in thread and small chunk of a gigantic swath of Idaho wilderness. We were having great riding on this car-less, “wilderness” road, but lingering in the back of our mind was the warning we had gotten from the Forest Service folks back in Custer: “We’ve heard the road up out of Loon Creek is washed out! Can’t get through there! Five feet of snow!” Usually we mostly ignore statements like this from folks who don’t have firsthand experience, but still…. then we met an XC moto guy heading back towards us who surprised us by saying he already heard of us and our intent and said that the climb out of Loon Creek was “a lot different” than the nice road that we were on; he had turned back because of “avalanches”, blowdowns, and washouts. Ah well, that’s a moto! Those guys are wimps! We’ll have no problem! It’s a 5000 foot climb in 10 miles from the Diamond D dude ranch at Loon Creek to the ridge below Pinion Peak, so it’s a grind, but at least it was also blistering hot! We ground up the first couple of miles until….indeed, we found an “avalanche”. A huge fire had swept through the area the year prior followed by big rains, and literally the denuded hillside had simply swept downhill, taking everything with it, including the road! 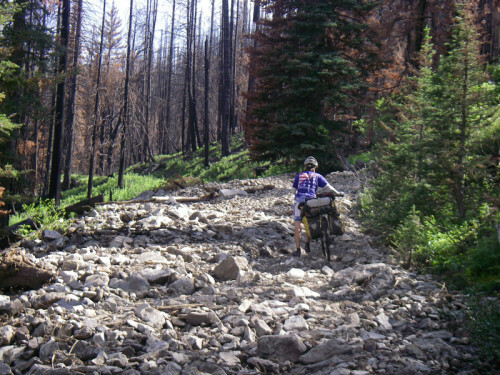 Riding was not an option for a couple of miles, and truthfully I’m not even sure that rebuilding the road is an option since it’ll just happen again (this year that route is still blocked by snow up high, so the Forest Service hasn’t even gotten to that section yet). But there wasn’t much traffic! And as we got closer to the treeline the road improved dramatically and became very rideable again as we inched our way upward toward the ridge. 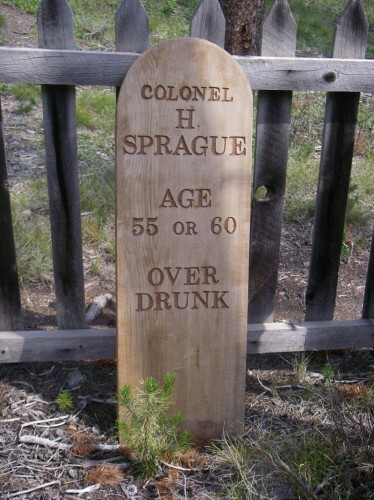 A Custer Cemetery headstone from late 1800’s. When we finally assumed the ridge the views of the Frank Church Wilderness and the Sawtooths in the distance were sublime and enhanced by the fact that there were no woods to obstruct our views; it had burned as far as we could see! 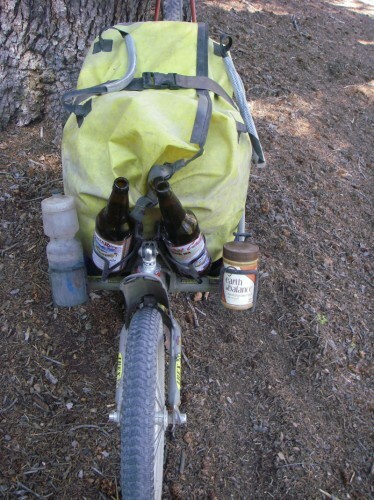 We had left our last water source in anticipation of going up and over the top and down into the next drainage, but to add an exclamation point to a long, tough day the road actually rolled up and down along a ridge for seven more miles. Glorious riding, but the light was starting to wane and we were keen to find some water and camp. A couple of lakes glinted tantilizingly a thousand feet of steep hillside below us, but still we rolled on the ridge until finally we began the plunge down and came upon a tiny pond that looked like a mosquito haven, but it was water which meant we could flop down and camp. A long, bumpy (but ever-improving) descent to Highway 20 followed, with a welcome spin on the highway to Stanley, where the Stanley Baking Company looms large for hungry cyclists needing to fuel up for the haul back to Ketchum. Not far out of Stanley is the beautiful Redfish Lake tucked into the foot of the Sawtooths, which – despite being overrun with tourists in high summer – has a great restaurant, nice campgrounds, and a super fun and technical singletrack loop around the perimeter of the lake. The cheap boat ride across the lake lands at another campground that’s pretty much deserted (and you can bring bikes on the boat) and offers hiking access up to the incredible alpine Elephant’s Perch Yosemite-esque granite face and other peaks beyond. For the final leg back to Ketchum we spun up the highway for a few miles and then at the base of the Galena climb we veered onto the graveled Old Pass road that parallels the highway and is a far preferable, no-traffic route on moderately-knobby tires that tops out right near Galena Pass. All the western states have plenty nice of Forest Service roads that see little use, but Idaho seems to not only have more than most but they are really high quality and actually “go somewhere” (instead of ending in Pacific Northwest clear cuts or Utah desert mines). As such they enable that giant green swath in the middle of Idaho to have thousands of miles worth of stellar wilderness touring. But some challenging ‘riding' lay ahead.